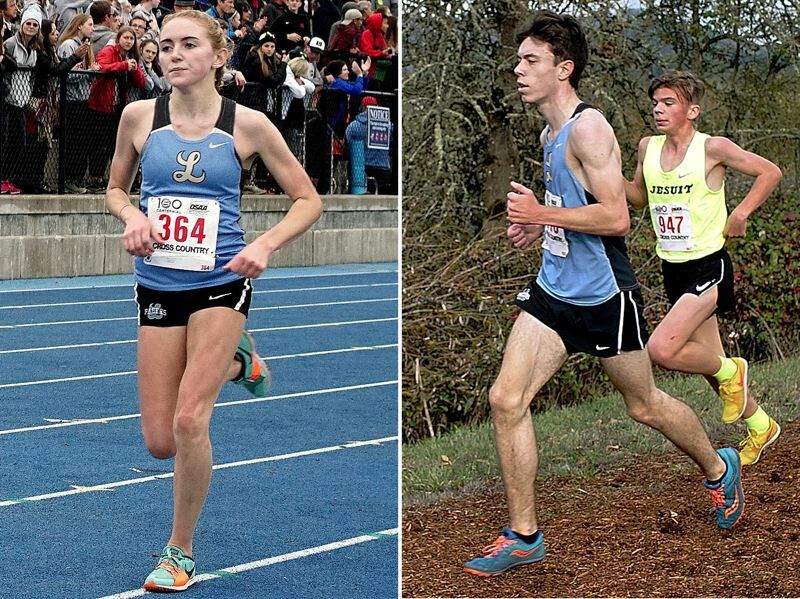 You could forgive Lakeridge's Evan Wheeler and Holly Lane if they felt a little lonely at state. Wheeler, a senior on the Lakeridge boys cross country team, was the Pacers' lone qualifier to Saturday's Class 6A state meet at Lane Community College in Eugene. Lane, a freshman, held the same position for the Lakeridge girls team. Despite the solitary nature of their races — each was one of 155 competitors in their respective events — Lane and Wheeler went out and gave it their best shots. Wheeler, who qualified for state by finishing seventh at the Three Rivers League meet back on Oct. 24, stepped up at state and ran to 49th overall with a finishing time of 16 minutes, 32 seconds — two seconds faster than his time at district. Central Catholic won the boys state championship with 93 points — the Rams tied Jesuit but had the faster sixth finisher — followed by Sunset at 124, Franklin at 145 and South Eugene at 174 in the top five. Rounding out the meet's top 10 were Sherwood at 186, Summit at 205, West Linn at 208, South Medford at 261 and Lincoln at 272. Sunset senior Ethan Reese took the individual title with a winning time of 15:37, followed by Franklin's Aidan Palmer (15:38), Jesuit's Will Sheaffer (15:40), Central Catholic's Ben Brown (15:42) and South Eugene's Ian Twyman (15:43) in the day's top five. The complete team scores were: Central Catholic 93, Jesuit 93, Sunset 124, Franklin 145, South Eugene 174, Sherwood 186, Summit 205, West Linn 208, South Medford 261, Lincoln 272, Wilson 285, Sheldon 333, Bend 382, Tualatin 384, Aloha 396, South Salem 408, Barlow 411, Clackamas 450, McMinnville 465, Oregon City 508 and Forest Grove 533. In the girls race, Lane won her second straight individual berth to state after finishing seventh at the Oct. 24 TRL district meet. She made the most of her opportunity, racing to 42nd place with a finishing time of 19:31. In 2017, Lane placed 50th at state. Summit won the girls state championship with 39, followed by Jesuit at 68, Lincoln at 147, St Mary's Academy at 156 and Sunset at 159 in the top five. Rounding out the meet's top 10 were Wilson at 206, South Eugene at 208, Tualatin at 218, Franklin at 240 and South Salem at 284. Jesuit junior Makenna Schumacher took the individual title with a winning time of 17:45, followed Sunset's Kelly Makin at 17:52, Jesuit's Alexis Kebbe at 17:53, Sprague's Kaylee Mitchell at 18:04 and Jesuit's Kelsey Gripekoven at 18:10 in the day's top five.